The Yellowstone is only created when we find a matching pair of large burls for the base. This billiard table is the finest example of our craftsmanship. A unique blend of Nature's own handiwork and man's creativity truly makes each Yellowstone a one-of-a-kind work of art! Each of the huge burl logs that make up the base is an extremely rare find. Occasionally, as with the example pictured here, we find a single burl log large enough to split in half to make both of the base pedestals. 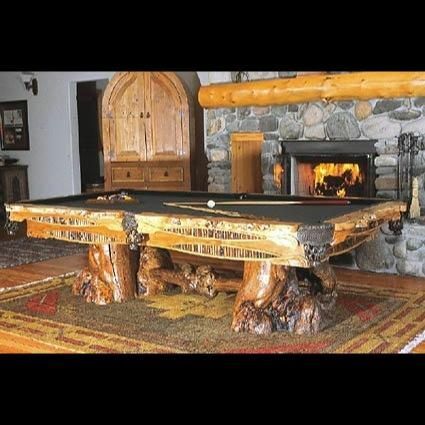 This log has the spectacular combination of a wonderfully, knotted, gnarled look on one side and a heavily, beetle-tracked look on the other, giving this pool table a totally unique appearance from each side.